Welcome to Tibet! Visiting Tibet is a once-in-a-lifetime experience which will offer you a better knowledge of the marvelous nature, the mysterious Buddhism and your own spirit. We’ve summarized tips and advice on how to visit Tibet, hope that they are helpful for your Tibet tour plan. According to the rules, international travelers should apply for a Tibet Travel Permit to enter Tibet. For citizens of other counties, you should apply for a Chinese Visa via the embassy of China in your country in advance, and send us your scan copies of your documents. However, for travelers from Hong Kong and Macau, there’s no need to apply for a visa. The permit is issued by Tibet Tourism Bureau in Tibet and several days are needed to get it, according to your travel destinations. If you just want to stay in Lhasa, only 4 working days are expected. For an Everest tour, 7 working days are needed. If you want to travel to the Mount Kailash, getting the permit takes at least 30 days. In a nutshell, you’d better book your tour at least one month before your departure, so that we can prepare the permit for you in time. Once you book our tour, we guarantee you the Tibet Travel Permit and a fixed depart time, don’t worry about that. The high season of tourism in Tibet is from summer to mid-autumn, while the best time to visit Tibet is from July to October. During the time, you can enjoy mild weather, enjoyable sunshine, pure sky and a clear view of landscapes. Summer is the best time for photographers while autumn is the best time for trekkers. However, travelers flood into Tibet during this period, you will have you tour will crowds. Winter of Tibet owns strong sunshine, which makes the weather not as freezing as you imagine. Visiting Tibet in winter means fewer travelers, lower cost, and unique sceneries. Although some roads and scenic sites in remote areas are blocked because of the snowfall, Lhasa, Shigatse, and Nyingchi are always available during the whole year. If you plan to visit Tibet in spring, it’s highly recommended to have a trip to Nyingchi. Known as the “Switzerland of China”, Nyingchi is blessed with mild weather and beautiful scenery. Especially when peach flowers bloom in spring, the famous Peach Flower Festival really worth a visit. Get to Tibet is by train is the most popular way. Since the Qinghai-Tibet Railway opened in 2006, traveling to Tibet is more convenient and flexible. You can board the train from Beijing, Shanghai, Guangzhou, Xining, Chengdu, Lanzhou, Chongqing, and Xian. The train will pass Qinghai-Tibet plateau and offer you a breathtaking scenery of snow-capped mountains, crystal lakes, peaceful pastures, huge wilderness and blooming flowers. The train is equipped with modern facilities, such as oxygen system. Travel to Tibet by train will also offer you a lower risk of suffering from altitude sickness because you can accommodate to the altitude little by little. For a more comfortable and time-saving journey, you’re also suggested to get to Tibet by plane. In major cities of China, domestic flights to Lhasa are easily available. Flights to Lhasa depart from Beijing, Shanghai, Guangzhou, Xian, Chengdu, etc. You can check the schedule online and choose the flight which meets your requirements. If you book our tour, we can arrange train and flight tickets for you with a good price. Since train tickets are always in large demand, the price varies according to the season. For most travelers to Tibet, the first destination is Lhasa. As the capital of Tibet with 1, 300 years’ history, you can’t miss this mysterious city when you visit Tibet. The Potala Palace is the most important landmark located at the heart of Lhasa. This red and white masterpiece is originally built by the king Songtsan Gampo in 637 AD and rebuilt by the fifth Dalai Lama. As the winter palace of Dalai Lama, it houses numerous artworks and statues of Buddha, which are precious and delicate. The Jokhang Temple will be your second sites to visit in Lhasa. It’s recognized as the holiest temple in Tibet and attracted countless pilgrims from every corner of Tibet to worship in front of it. Around Jokhang Temple, Barkhor Street is a business street filled with handicrafts, religious items, and Tibetan snacks. Pilgrims kora around this sacred street and travelers can buy some Tibetan souvenirs there. Mount Everest is located in Shigatse, remote from Lhasa. Step on the highest peak of the world is a lifelong dream for many travelers, you can realize this dream by visiting Tibet. You can enjoy a panorama of the Himalayas and admire the marvelous sunrise of golden Everest peak by staying overnight at base camp. Mount Kailash is recognized as the holiest mountain in both Hinduism and Tibetan Buddhism, has been worshipped by pilgrims during past hundreds and thousands of years. 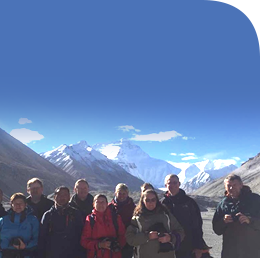 Visiting Mount Kailash and the holy Manasarovar Lake on the south of it will offer you an excellent natural landscape. You can also kora around the holy mountain with pilgrims, and gain a different understanding of your soul.